The Fourth of July is perhaps my favorite American holiday. 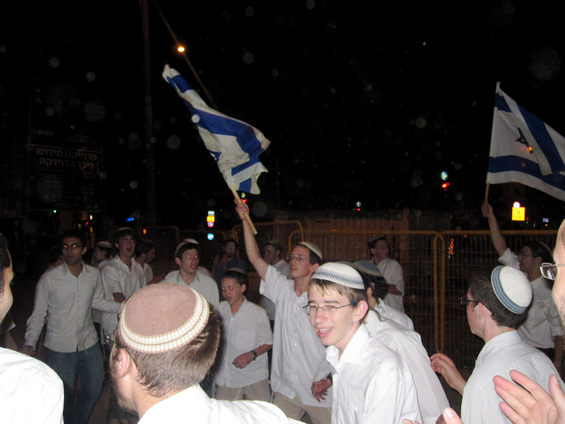 So it should be no surprise that Yom Ha’atzma’ut is one of my favorite Israeli holidays, and for many of the same reasons: summer weather, barbeques, celebrations, and of course, fireworks. But as proud of an American as I am, Yom Ha’atzma’ut is more meaningful to me as a Jew. It celebrates the return to our Biblical and historic homeland, to Jerusalem, the eternal capital of the Jewish people, and the fulfillment of God’s promise to us as His Chosen People to bring us back to the Land of Israel. While I’ve been able to attend memorial ceremonies and Independence Day parties before thanks to the large and vibrant Jewish community in Boston, the experience obviously cannot compare to what it’s like here in Israel. But before I get to celebrating Israel’s 62nd birthday, I will write a bit about Yom Hazikaron, and the importance of remembering the soldiers who died defending the State of Israel and her citizens, and all the men, women, and children murdered by Islamic terrorists simply because they were Jewish. I marked Yom Hazikaron on Sunday night by attending a memorial ceremony designed for American olim and other English speakers. 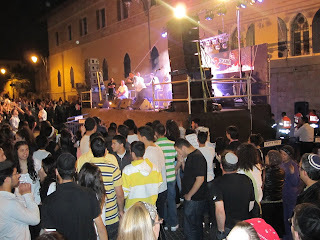 The ceremony began with the traditional siren, when all of Israel comes to a standstill to observe a minute of silence. Then, there was a tribute to Staff Sgt. Ari Weiss, an American oleh and sargeant in the Nahal Bridgade, who was killed three weeks shy of his 22nd birthday in Shechem battling Hamas terrorists in 2002. A touching video showcased who Ari was and why he was so loved by his friends and family. Ari’s father, Rabbi Stewart Weiss, spoke beautifully after the video tribute, re-telling the audience what he said to the people who attended his son’s funeral: that everyone go home and sing “Am Yisrael Chai” in Ari’s memory. Thank God I haven’t personally suffered the loss of anyone serving in the IDF, so the ceremony really helped me internalize and personalize what it means to lose a loved one. I have never lived a day in my life without the State of Israel being a fact, and it’s easy to take her existence for granted. But the juxtaposition of Yom Hazikaron and Yom Ha’atzma’ut reminds us that throughout Israel’s history, its citizens have had to defend the State each and every day, and often with their lives. This is why it’s so appropriate for the day of mourning to be followed by celebration, reminding us that these losses were not in vain, that helped create and protect the State of Israel.